Stereotypes have plagued mankind since the beginning. It is a way to be comforted in each other’s silly likenesses and ridicule other people’s weird differences. But where did stereotypes develop? Here’s one idea. Someone sat down one day angry at a person or most likely a group of people. He wrote down all the embarrassing or annoying traits of the people he hated and started sharing them with his friends. His friends began using these specific traits to mock and ridicule people they didn’t like and the idea spread. Typically, a stereotype focused on a group of people with a common background or even coming from the same country. Yet, stereotypes for writers have transcended normal reasons for grouping them together. We come from every spot on the planet, every ethnicity, every shape and size. Even what we write varies not only in type (poetry, non-fiction, fiction) to the genre in which we write (sci-fi, romantic, Latin American History, etc). The one thing we have in common is the act of writing. We all have a need to write something every second of the day either in our heads or down on the computer. So, how did someone find all of these things in common that we now associate as stereotypes of writers? I don’t have an answer for that, but I decided to go through all of the stereotypes and see which ones I fit in and which ones I don’t. To be honest, my guess as to how stereotypes began is not how I view them now. Not all stereotypes are bad and sometimes they are true indicators of that person or group. For me, I see the stereotypes of writers as funny misunderstandings as well as badges of courage we must push past. 1. Writers are alcoholics/drug addicts or both-Now see here, not every writer has to drink to get inspiration or be high to write. However, it is a pattern. Maybe it is the sensitivity of artists, struggling with questions about life that no one else bothers to think about. Or maybe it’s that the booze takes the edge off the fact that we have to work three jobs just to pay for bills and still have to make time to write the next chapter. Anyway you look at it, the greats have sometimes needed a shot of whiskey to get them ready to write and a group of writers are always more enjoyable after placing a bottle of wine (or several) between them. 2. Writers always drink coffee and smoke profusely–I don’t have either of these qualities, but I know many that do. I think this a vastly overrated stereotype because each person is different. I prefer tea, but the result is the same. You’re all warm on the inside and it tastes amazing. As for the smoking, I don’t smoke because I want to be as healthy as possible to spend the next 70 years writing. 3. Writers are loners- This one is mostly true, but we have to be. Because at the end of the day if you can’t have some peace and quiet to do the writing you need…you don’t get paid or get the voices of those characters out of your head. At the same time, we yearn to be social butterflies. While social interaction may not be required during the writing process of a story, the process before and after allows us to interact with as many people as we want. In this digital age, publishers are doing less of the marketing side of publishing and are laying the task to the writer. So, we not only have to come up with the idea, write it all down in a creative way, and market it to billions of people in hopes of them buying it. It isn’t always a bad thing. As my one writing friend just said, “The plus side to being a writer is that going on Facebook is part of my job.” And it’s true. Writers are becoming more social creatures out of a need to network. Social sites like Facebook, Twitter, and blogs like these are important to creating a fan base before you are published and famous. I’m constantly checking Facebook and my blog to see how my work is being received. It is important to know that writers can come out of our shells and interact with “regular” people. It’s such a different sight to see a bunch of writers get together because you would never imagine a writer being a loner after witnessing all of them together. 4. Writers are crazy-Yes, there is a stereotype that writers are insane. They have to be after writing things no one else can imagine. Bi-polar, schizophrenia, and depression have graced the brains and personalities of the most famous writers ever to exist. There will always be studies done until the end of time on the connection between creative minds and mental disorders. It could be the substance abuse or the isolation that creates crazy writers, but there is one fact that goes unnoticed. 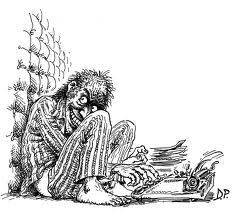 Even if a writer is 15 kinds of crazy, they still have a better grasp on the human condition than the completely sane readers that buy their writing. We write because we need to write. Because something inside us compels us to tell a story no one else has come up with yet. Because our hearts say that the world needs to read this character, this situation and only I can write it. Whether we do it alone in a make shift office in the attic or have a bottle of Jack Daniels besides our laptop, the result is the same. A story or perspective on life that only sensitive artists can produce for the world. No matter if you end up killing yourself like Sylvia Plath or live a long life like Ray Bradbury the need inside you to write will always push you to give the world what you have to offer. A story never told before from your eyes. So, I may be a loner who drinks too much tea and could eventually become bi-polar. At least I know my purpose in life…to be now and always, a writer. Feel free to share other stereotypes of writers or which stereotypes you have. The more stereotypes we have means the more people we are affecting as a group, which is always a good thing. Bad press is better than no press. So stereotype away! What Being Social Is All About! This post is inspired by some of the graduates of my M.F.A. program at Carlow. They detailed what life is like now for a writer and how he/she can appeal to the masses through social media. And guess what? They hit the nail on the head! Now my idea to start a blog also stemmed from this idea to appeal to potential readers. However, I have found that making myself write every day on a site that people actually care about what I say is empowering. It gives me confidence, inspiration, and the courage to write more each day. So, when the graduates of the program showed me the following video, I was changed. No longer do I just post on Facebook because I feel the need to say something funny or interesting. I made posts showing who I am, even in my private account. Talking about ideas I cared about and issues that are important for other people to read. This change in how I view social media is what brings us to the social media revolution. The opportunity for our generation to alter how we communicate and create relationships all over the globe unlimited by boundaries and oceans. It is urgent, now more than ever, to support the revolution with the recent protest of SOPA and PIPA, which could ultimately restrict our freedoms.